Three days in Hurghada allow you to experience the natural wonders and adventures of the Red Sea, enjoy the city’s attractions, and discover the surrounding desert. You’ll also have time to venture farther afield, with trips to Cairo or Luxor. Here’s how. The Red Sea is Hurghada’s star attraction, so immerse yourself in its waters. For spectacular snorkeling, join a full-day trip to coral gardens, islands, and dolphin habitats. Scuba dive trips that cater to both beginners and experienced divers run to places such as Giftun Island. Alternatively, step aboard a fully equipped boat and spend the day fishing for some of the Red Sea’s 1,000 species, such as grouper and snapper. Later, make tracks for Hurghada’s desert. Cross the plains on an ATV, or choose a tour with multiple activities, such as camel rides and Bedouin encounters. Many extend into the evening, with dinner and belly-dancing shows beneath the stars. Take a (long) day or overnight trip to Cairo or Luxor, by air or road. Perhaps go overland to Cairo to see the Giza Pyramids and Egyptian Museum, home to Tutankhamun’s treasures. Closer by is Luxor, the capital of Egypt during pharaonic times and the location of the Valley of the Kings, Karnak, and more. If you’re not planning a return to Egypt any time soon, it might make sense to visit both Cairo and Luxor in one 2-day trip. Fly to Cairo in the morning and spend the day touring before flying on to Luxor for overnight and to explore its big-ticket sights the next day. Spend your final day exploring Hurghada’s sights, such as St. Maria Church and old mosques, on a city tour, then let rip at a cable water park, bouncing across the waves on a wakeboard. Alternatively, slow the pace with a glass-bottom boat or submarine ride to see the underwater world without getting soaked. Other options include a day out at family favorite Aqua Jungle Park, with 35 chutes, 14 pools, and other attractions. Finally, round off your trip with a dinner-and-show excursion. Savor a traditional Egyptian dinner before watching an outdoor Arabian fantasia show of acrobatic horse-riding displays, folkloric dancing, stunts, and music. Your private Luxor day trip from Hurghada with stop at Valley of the Kings includes private air-conditioned minivan transport, an expert guide and a whole lot of history and fun. Learn about the archaeological treasures of this famed city and venture into ancient tombs with your own Egyptologist. Make stops at Valley of the Kings, Colossi of Memnon, Karnak Temple and Temple of Hatshepsut. Then journey into the Nile on a ‘felucca’ (sail boat), where you’ll enjoy lunch on a quiet island. There’s no better way to learn about and experience the wonder of Luxor than on this private tour. 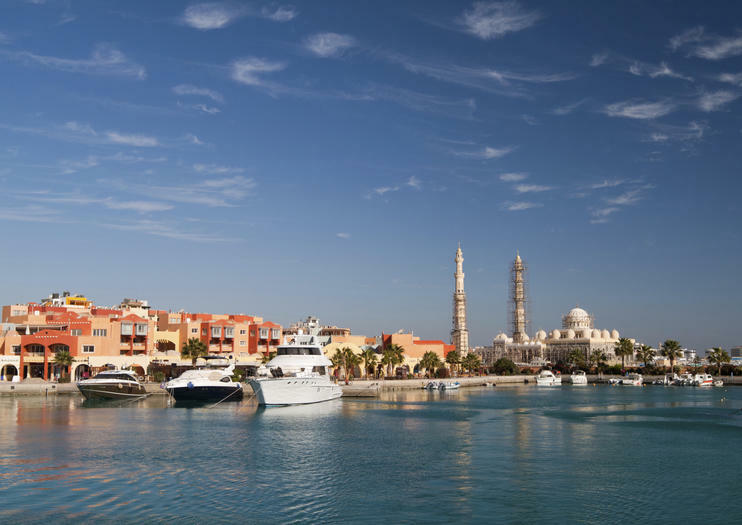 Experience the sights of Hurghada on this 3-hour private tour. Traveling between the sites by air-conditioned vehicle, visit the beautiful Big Mosque, Church of St Mary, and scenic port area. Stop midway for a delicious lunch and finish with free time to haggle for souvenirs in Hurghada’s colorful souks. As you explore, enjoy entertaining commentary from your private guide to get a flavor of life and culture in the city. Experience the ancient world’s iconic sites on a 2-day private tour from Hurghada including flights to Cairo and Luxor, and discover the Giza Pyramids, Valley of the Kings and Karnak Temples. See the enigmatic Sphinx that keeps watch over Giza’s three towering pyramids and glimpse gleaming antiquities in the Egyptian museum. Walk the tombs, colonnades and temples in Karnak and the Valley of the Kings, and see the sprawling monument to Hatshepsut, Egypt’s first female pharaoh. Sail on the Nile in a traditional felucca, then finish your trip in Hurghada. Get the best of both worlds with this Hurghada quad bike tour that includes equal parts epic adventure and dramatic desert scenery. Cruise through the stunning Egyptian landsacpes atop your quad bike with the setting sun, spectacular sand dunes, epic canyons and the Sinai Mountains as your backdrop.